Last week I told you that I had been selected to be one of Cuddledry's Super Bloggers, meaning I would keep you up to date with all their latest new products. You lucky readers didn't have to wait long for an update. I present to you the new Pink Polka Dot range, perfect for those of you who have a girly girl in the family. Or like me who have four girly girls to cater for!! First up we have the new apron towel, fastening around your neck, leaving you with yor hands free for those lovely newborn snuggles. I am hoping my cousin, who is due her first baby in a few days has a girl because I really would like and excuse to buy one of these, my "baby" is getting to big for one of these. Next up, anyone fancy turning into a bug, but not just any bug, a really soft and cuddly bug, then this new bamboo cuddebug towel is the one for you. I really think they should make this one in adult size too!! For now though I will have to settle buying one for each of my daughters, especially great for those roaming toddlers. 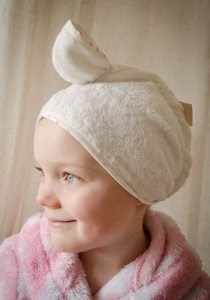 And if those two haven't got you excited enough what about this fantastic cuddletwist towel, superabsorbant, taking the fuss out of drying your child's hair. You can buy the ecru/gingham version of this towel from John Lewis at the great price of £8.99. I squeeled when I saw this because in the Hazelden household there is only one hair towel shared between five of us at the moment, this means we could have one each. Now some of you are probably thinking that is an awful lot of pink, what about the rest of us!! Fear not, if you don't have a special little princess to treat or perhaps pink really isn't your colour. Mothercare have an "exclusive" coffee and cream range of cuddledry towels, still made with the same super soft and absorbant materials to tickle your fancy. Disclaimer : This post is part of me being a super blogger for cuddledry, I was not paid for writing this post.